Northants Steelbacks skipper Alex Wakely says the fact his side have never previously played a T20 match at Hove could be an advantage in their quarter-final against Sussex Sharks. The only time the two sides have met in the 20-over competition was back in 2009, when Sussex came out on top in a close semi-final at Edgbaston. However, the Steelbacks will be out for revenge this week as they try to win their first away T20 quarter-final in four attempts. And Wakely is hopeful that the new surroundings will prove a positive for his men on Wednesday evening. “I quite like that (we haven’t played there),” he said. “We’re going down there with no hang-ups of what might have happened there before – we just have to go down and perform. “When we won finals day (in 2013), history was supposed to be against us there. “We were told that the team that won the first semi-final had never gone on to win the final. The game will be held at the BrightonandHoveJobs.com County Ground, which is set to be sold out. However, Wakely insists his team won’t be bothered by the opposition’s backing. “I’ve not played there for a Twenty20, but I have played a couple of one-dayers and we have some idea of what to expect,” he said. “They are quite a hostile crowd with lots of people close to the pitch. But that’s what you want in Twenty20. You want all that, the abuse - it gets you going. 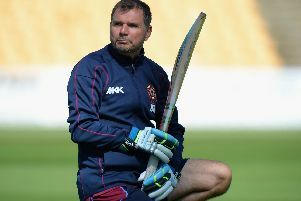 The Steelbacks won the title two years ago, and Wakely feels his side can cope with anything that is thrown at them following that experience. He also knows he can let his players prepare on their own, insisting they will know what they need to do to get the job done this time round. “Probably the last thing you want when you’re nervous anyway is the captain coming up to you and telling you what to do,” Wakely said. “We’ve got players who have been through that title run and players who have played in internationals. “The hype and pressure of a quarter-final won’t shock anyone. “I remember when I came into my first quarter-final I was the most excited man in the world and nerves probably got the better of me. We’re lucky this year we don’t have too much of that. Wakely also says that the match has come at a good time for the club, as they can now put aside any off-field troubles to concentrate solely on bringing success back to the county. “We want to get the fans talking about cricket and not the other stuff,” he said. “We can’t control that other stuff anyway. “We targeted the Twenty20 and the 50-over competitions before the season and now we are in a position to repay that.